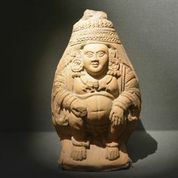 In 2005, Canada’s Royal Ontario Museum was offered a rare sculpture of a Seated Buddha carved from red sandstone in the second century. It was from India’s ancient city of Mathura, the second capital of the Kushan empire, and one of only a handful of such sculptures to have appeared on the market in recent years. The Royal Ontario was keen to buy the Seated Buddha – until curator Deepali Dewan called the expert who had authenticated the sculpture for Wiener. 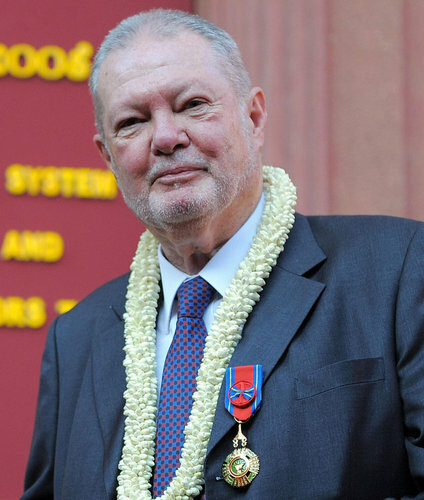 Donald Stadtner, an authority in Indian art, told Dewan that he believed the statue had been illegally exported from India and given a phony ownership history to cover its tracks. After talking to Stadtner, the Royal Ontario Museum decided pass on the sculpture, Dewan confirmed in a recent email. Months later, Wiener offered it to the National Gallery of Australia for USD$1.2 million. Wiener told NGA officials she had purchased the sculpture in 2000, museum records show. Previously, Wiener said, the sculpture had belonged to an Englishman named Ian Donaldson, who claimed to have purchased it while posted in Hong Kong between 1964 and 1966. She provided the museum with a 1985 Certificate of Ownership signed by Donaldson. It was the only record of sculpture’s ownership history, but the museum did not attempt to contact Donaldson. In July 2007, Wiener sent an invoice to the NGA for the discounted price of USD$1,080,000 and a signed guarantee offering to reimburse the museum if the provenance were ever proven false. Yet this was the extent of the museum’s due diligence. Museum officials never contacted Stadtner, whose authentication report for the Seated Buddha was among the paperwork provided by Wiener. The funds for the purchase were provided in part by Ros Packer, wife of the late media tycoon Kerry Packer and one of Australia’s most prominent philanthropists. In 2012, I got an anonymous tip that the sculpture’s ownership history had been fabricated. 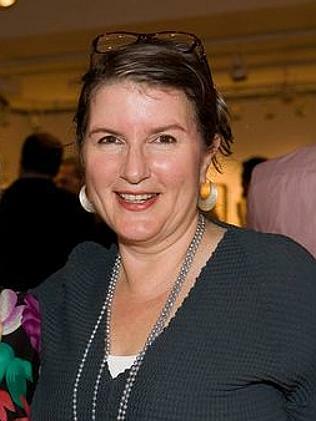 The source identified the dealer as Nancy Wiener, and suggested the sculptures had been illegally exported from India. I shared the tip with Michaela Boland at The Australian, and in May 2013 we requested the sculpture’s ownership history from the NGA. The museum claimed the information was secret: “We do not provide details of this nature regarding acquisitions from the national art collection for clear commercial in confidence reasons,” museum spokesman David Edhill wrote. Boland filed a Freedom of Information request for the records. In the fall of 2014, the Australian courts ruled in our favor and released copies of the NGA’s records – with the name of the dealer and former owner redacted. In November, we co-wrote a story in Australian about the case, linking the anonymous tip to the account in the museum records. In October 2014, as the records were released, the NGA began investigating the ownership history of the sculpture. It was only then that an NGA curator contacted Stadtner and asked him for any information he had about the sculpture’s origins. In a Nov. 5th email to museum officials, Stadtner explained his long-held suspicions about the sculpture. The NGA’s was the second Kushan Buddha that Stadtner had examined for Wiener, he explained. The first he had studied in 1999 before it was sold to Singapore’s Asian Civilizations Museum. Some time after, on a visit to Bangkok, Stadtner said he met with the Bangkok-based British collector Douglas Latchford. The main topic of conversation was Latchford’s role in the sale of fake Burmese bronzes, Stadtner said, one of which had been sold to the ACM in Singapore in 2000. While there, however, the two men discussed the ACM’s Seated Buddha. The NGA’s records, which Stadtner had not seen, appear to support his story: Wiener told the museum that the Buddha had belonged to a British ex-pat living in Hong Kong. Did Donaldson own the statues? What is his connection to Latchford? It is difficult to know: Andrew Ian Donaldson, listed at the same Hong Kong address supplied by Wiener, died in 2001, records show. In 2012, Latchford was identified in federal court records as a middleman in the trafficking of looted antiquities from Southeast Asia. Authorities allege Latchford knowingly purchased two looted Khmer sculptures from “an organized looting network” and conspired with the London auction house Spink to obtain false export permits for them. The case was a civil lawsuit, and Latchford was not charged with a crime. But after a lengthy legal battle, Sotheby’s agreed to return its sculpture to Cambodia. Soon after, the Norton Simon Museum, Christie’s auction house and the Metropolitan Museum of Art all returned sculptures tied to Latchford. UPDATE: The Cleveland Museum returned another looted Khmer sculpture linked to Latchford in May 2015. Melville-Brown,Latchford’s attorney, has previously asked me to remove our past coverage of Latchford’s role in the Sotheby’s case. I have declined, noting that the account is based on federal court records protected under U.S. law. The Asian Civilizations Museum has refused to release the ownership history for its Seated Buddha. When pressed repeatedly, a spokesperson for the museum said, “The Kushana Buddha was purchased from a respected international dealer in the year 2000, who had purchased it from a private collector who had owned the piece since the 1960s.” Is that private collector Ian Donaldson? The museum won’t say. Last fall, I went by Nancy Wiener’s Manhattan gallery to see if she could clarify the history of the Seated Buddha sculptures. Her gallery manager refused me entry and claimed he did not know how to put me in touch with Wiener. She has not responded to emails. 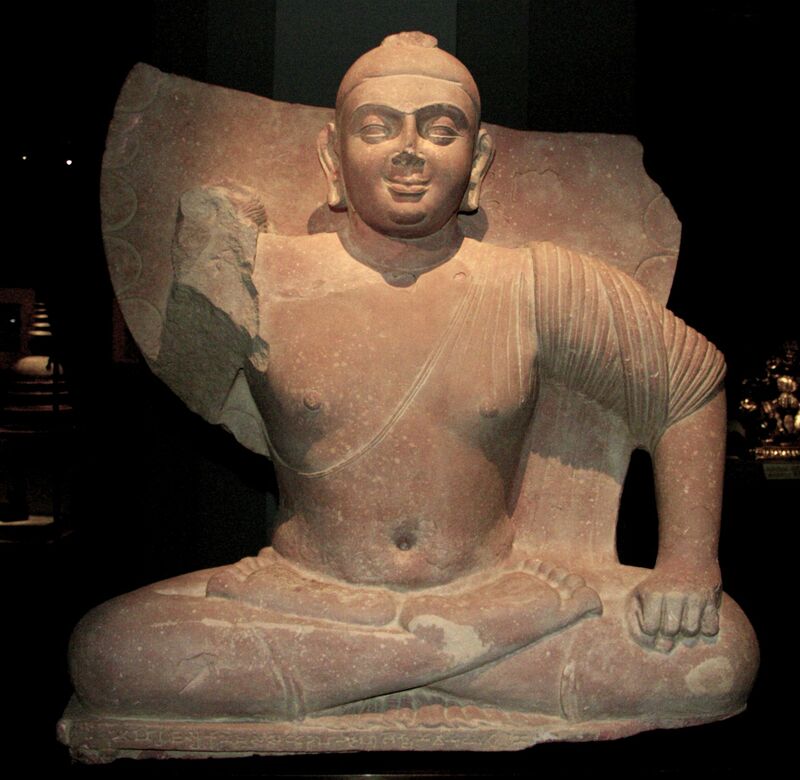 In January, the Times of India reported that Australian authorities had concluded that the NGA’s Seated Buddha was stolen from an archaeological site and agreed to return it to India. National Gallery spokeswoman Alison Wright would neither confirm nor refute that account, but acknowledged that the museum “commenced legal discussions” with Wiener in November. “Those discussions have not yet concluded and therefore we are not able to comment further,” she said. UPDATE 6/15/15: The Asian Civilizations Museum has agreed to return its looted sculture of Uma, according to Indian press reports. Twenty eight additional Kapoor objects at the museum remain under review. UPDATE 3/20/15: The Asian Civilizations Museum has filed a lawsuit against Subhash Kapoor in New York City seeking repayment of $1.4 million it paid him for antiquities with falsified ownership histories. As noted earlier when Australia’s NGA took a similar step, such lawsuits are unlikely to prevail given Kapoor’s on-going criminal trial in India. UPDATE: In response to this report, the Asian Civilizations Museum confirmed our accounting and released information on a few objects we missed, including six additional paintings purchased for $100,000 and a 10th century stone Nandi purchased for $55,000. That brings the total paid to dealer Subhash Kapoor to more than $1.3 million. The museum has yet to release any information on the provenance for the ancient objects. 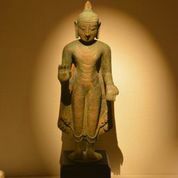 Singapore’s Asian Civilizations Museum bought more than $1 million of art from disgraced Manhattan antiquities dealer Subhash Kapoor, according to business records from Kapoor’s Art of the Past gallery. Invoices that Kapoor sent to the ACM between 1997 and 2010 detail more than two dozen objects he sold, including nine antiquities of unclear provenance. (Kapoor also sold Indian manuscripts and paintings that to date have not be the subject of law enforcement investigations. Our complete Kapoor coverage here.) Most of the invoices were directed to the ACM’s former senior curator for South Asia, Dr. Gauri Krishnan. Krishnan is now director of the Indian Heritage Centre at Singapore’s National Heritage Board. The ACM did not respond to a request for comment. Last December we reported that the ACM’s sculpture of Uma Parameshvari was stolen from the Sivan Temple in India’s Ariyalur District in 2005 or 2006, according to the court records filed with the guilty plea of Kapoor’s gallery manager Aaron Freedman. In January, the ACM acknowledged it had purchased a total of 30 objects from Kapoor, who currently stands trial in India for trafficking 18 idols stolen at his request from local temples. The ACM did not name the objects, detail their provenance or disclose the price the museum had paid for them. 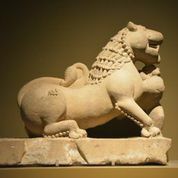 In February 1998, Kapoor sold the ACM an 11th Century sandstone Crouching Lion (above) from Kanoj, Uttar Padesh for $35,000 and an 11th century stone Goddess Camunda (right) from Rajshahi, Bangladesh priced at $25,000. After a $5,000 discount, the total invoice was for $55,000. The goddess had previously been published in Leaves of the Bodhi Tree (#24). That same month, Kapoor billed the ACM $9,500 for Hindoo Costumes, an album of 14 paintings from South India. Kapoor said the previous owner of the album was Sofia Anna Woolfe. In March 1999, Kapoor sold the ACM two 19th century watercolors from Tanjore for $6,000. An Art of the Past invoice dated April 2002 shows the ACM bought three ancient rattles from Kapoor for $10,000. The rattles (above) depict a seated man with bare belly, a boy seated with ball, and a seated man. Mohamed was indicted by US authorities in December 2013 on four counts of possession of stolen property and one count of conspiracy. Court records allege she fabricated false ownership histories for dozens of objects sold by Kapoor. In February 2007, Kapoor sold the ACM the 11th century bronze Chola sculpture of Uma Parameshvari mentioned above. The price, after a $100,000 “discount,” was $650,000. The Uma had appeared in Art of the Past’s 2006 catalog. 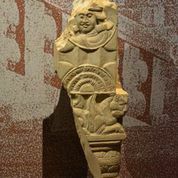 The ACM’s former curator Gauri Parimoo Krishnan has described the sculpture as one of the museum’s most prized artifacts, and it is featured prominently in museum promotional materials. Also in February 2007, Kapoor provided the ACM with a guarantee for the authenticity and provenance “of all artwork sold.” “If in the future the verity of either their provenance or authenticity is legally questioned and found to be incorrect, I nearby promise to reimburse the Asian Civilization Museum for the cost paid…” In April 2007, Kapoor billed the ACM $12,381 for the customs duties for the shipment of nine paintings an one manuscript, most likely the ones listed above. The total value of the ACM’s acquisitions from Kapoor: $1,328,250. Given the ACM’s extensive dealings with Kapoor, the Singapore museum should immediately release the provenance documents for all the antiquities it acquired from the dealer and proactively reach out to Indian and American investigators. Our gratitude to Vijay Kumar for supplying several images of the Kapoor objects on display in the ACM. Readers can follow developments in the Kapoor case at Kumar’s website Poetry in Stone. UPDATE 3/13/15: Selina Mohamed pled guilty in December 2013 to a misdemeanor conspiracy charge as part of a plea agreement with the Manhattan District Attorney’s office, reports Rick St. Hilaire. She was sentenced on March 12, 2015 to conditional discharge. The Manhattan District Attorney’s Office criminally charged the girlfriend of Manhattan antiquities dealer Subhash Kapoor on Friday, alleging she participated in a decades-long conspiracy to launder stolen antiquities by creating false ownership histories and, more recently, helpin to hide four stolen bronze sculptures as investigators closed in on Kapoor. Prosecutors allege that since 1992 Mohamed has been involved in the fabrication of bogus ownership histories for dozens of objects Kapoor sold to museums around the world. Since 2007, she also had nominal control over several of Kapoor’s storage facilities. The possession charges relate to Mohamed’s alleged role in the disappearance of four of Kapoor’s stolen bronze sculptures – two of Shiva and two of Uma – valued at $14.5 million. Kapoor instructed his gallery manager to send the Chola-era bronzes to Mohamed’s house in November 2011, the complaint states. After federal agents with Homeland Security Investigations searched Kapoor’s Art of the Past gallery and storage facilities in January 2012, Mohamed insisted that the bronzes be removed from her house. They are now missing. Mohamed, who records show was arrested on Friday, could not be reached for comment. Her attorney is not identified in court records. A 10th – 11th century sculpture of Lakshmi Narayana from northern India, now at the National Gallery of Australia. The NGA bought it from Kapoor in 2006 for $375,000, records show. As Kapoor noted in promotional materials, “The treatment of the eyes is similar to that of another Lakshmi-Narayana from the temple at Khajuraho,” a world heritage site in Madhya Pradesh that contains some of the greatest masterpieces of Indian art. Records show Kapoor visited the museum in April 1999 and met with the interim director, Larry David Perkins. Soon after, Kapoor offered to sell the statue to the museum with a false provenance created by Mohamed, records show. His promotional material described its importance, saying, “There is only one known Vishnu Trivikrama image in the world in the National Gallery of Australia, Canberra, which rivals the Art of the Past image.” The Harn purchased it for $75,000 in 1999. A 19th century painting at the Peabody Essex Museum in Salem, Mass. The museum purchased the painting from Kapoor for $35,000 in 2006. This is the first of painting that investigators have identified as bearing a bogus provenance, suggesting his criminal activity may have extended beyond ancient art. Kapoor sold or donated dozens of paintings to museums, particularly the Met. 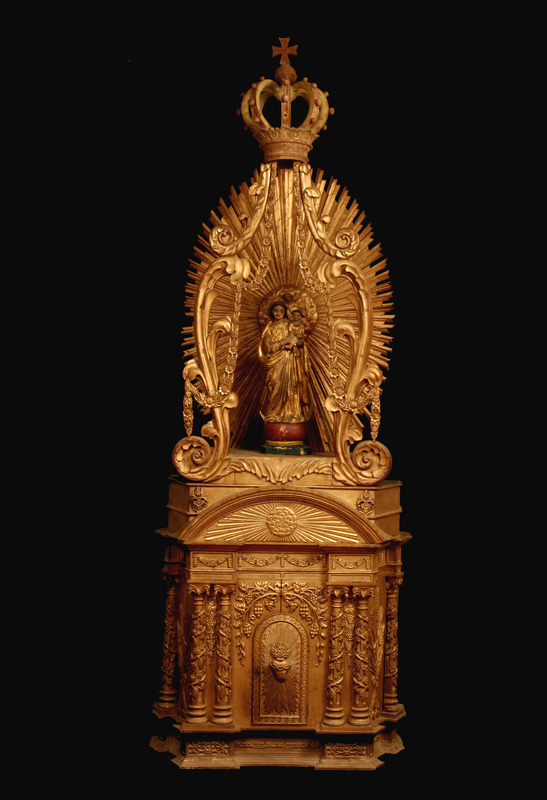 The complaint also notes Kapoor attempted to sell a Jain bronze shrine with a false letter of provenance to the Metropolitan Museum of Art in 1992. The museum did not acquire the piece, and its unclear where it is today. Going forward, a key question will be: To what extent did museums conduct basic due diligence on these claimed ownership histories? Many museums no doubt took them at face value. They should immediately make public any provenance information they’ve received from Kapoor to show their good faith and assist investigators with this burgeoning case.